KPCSTOC PEX Plumbing Kit is perfect for the DIY homeowner or the professional looking for the perfect way to get started with PEX Plumbing. The kit contains: 1x PEX crimper tool with lock hook PEX Crimp Tool features a comfort grip which makes PEX installation more easier. It is suitable for making copper crimp ring connections in potable water lines, radiant heat, snow melt, ice rink systems and among other applications. With its labor-saving design, it could eliminate distortion on the rings. 1x PEX shear cutter tool with lock hook and convenient carrying case The PEX shear cutter tool is ideal for cutting tubing for water applications. Its spring-loaded handle opens easily so you can make multiple cuts quickly and accurately. A textured grip lets you hold it securely for safety and speed. 1x Stainless Steel 1/2 in. Cinch Clamp Rings (Bag of 100) These Stainless Steel Cinch Clamps are perfect for connecting PEX pipe to crimp-type fittings in hard-to-reach spaces. Simply pinch the tab closed with the Cinch Tool to make the connection. 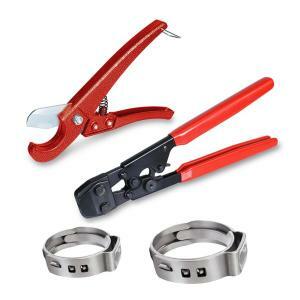 Cinch Clamps are made from corrosion-resistant stainless steel. 1x Stainless Steel 3/4 in. Cinch Clamp Rings (Bag of 50) These Stainless Steel Cinch Clamps are perfect for connecting PEX pipe to crimp-type fittings in hard-to-reach spaces. Simply pinch the tab closed with the Cinch Tool to make the connection. Cinch Clamps are made from corrosion-resistant stainless steel. Tbook.com crawls the web to find the best prices and availability on Crimpers and related Tools and Hardware products like The Plumber's Choice PEX Plumbing Kit Crimper Tool with Lock Hook Cutter Tool With Stainless Steel Cinch.... For this page, related items include products we find that match the following keywords: "Crimper" at our vendor partner Home Depot. The Plumber's Choice PEX Plumbing Kit Crimper Tool with Lock Hook Cutter Tool With Stainless Steel Cinch... is one of 41 Crimpers and related products listed in the Tools and Hardware section of Tbook.com If you have any questions on this product, please give us a call at 734-971-1210 during the hours of 9am - 5pm EST for assistance. Thank you for shopping at Tbook.com, the Internet Department Store!